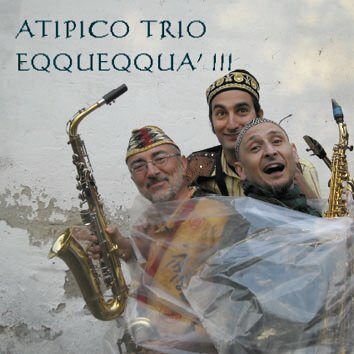 LEO RECORDS: CD LR 584: Atipico Trio - Eqqueeqqua' !!! This is the fourteenth CD by Carlo Actis Dato on Leo Records but only the second one by Atipico trio. Davide Telotta, Beppe Di Filippo and Carlo Actis Dato cover almost entire range of saxophones from bass clarinet to soprano with baritone, alto sax and clarinet in between. Fourteen compositions written by three members of the trio and spread over one hour cover a huge range of emotions that only Italians are capable of. From time to time saxophones are helped by helarious singing adding wit and fun to the whole procedure.